The global ban on cluster munitions is having an extraordinary impact on limiting investments in these weapons, which indiscriminately kill and maim civilians, says the Worldwide Investments in Cluster Munitions report released today. Compared to the 2017 report, the global level of financial investment in cluster munitions dropped from US$ 31 billion to $9 billion – a reduction of more than 75%, the report finds. The precipitous drop is due in part to the halt in production and delivery of the banned weapon by two major US based manufacturers, Textron and Orbital ATK. Both producers have made public statements to this effect, with Orbital ATK noting, “Cluster Munitions have no place in the arsenal of modern armies”. 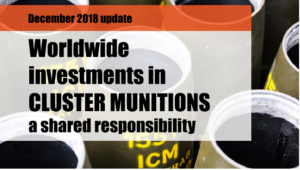 The Worldwide Investments in Cluster Munitions report – now in its ninth edition – examines global producers of the banned weapon, investments in these companies by financial institutions and states, and actions taken by private business, civil society and governments to prohibit such investments. Ten years after the international ban on cluster munitions was signed in Oslo, Norway, the overwhelming majority of all institutions investing in producers of the weapon are located in states that have not yet signed onto the Convention on Cluster Munitions the report finds. “The huge reduction in the level of funding identified for cluster munitions producers, as well as the diminishing pool of funders, is a testament to the growing global awareness that support for this weapon is unacceptable” said Michel Uiterwaal, project lead on cluster munitions at PAX and co-author of the report. The 2018 report discovered 88 financial institutions that together invested a total of nearly US$ 9 billion in the 7 cluster munitions producers identified – almost half the number of investors reported in 2017 (151). Of those, only seven investors have headquarters in states that have joined the Convention on Cluster Munitions. The research investigated all types of investments in the 7 cluster munitions producers between May 2015 and June 2018, based on international financial databases and other data. “The dramatic drop in both the number of investors as well as the total amount invested compared to the previous report shows how institutions globally are rejecting cluster munitions production. Still, we need to focus on the emergence of new producers as well as the continued investments in cluster munitions worldwide. These weapons were banned by the international community due to their indiscriminate nature and proven record of killing and injuring civilians,” said Hector Guerra, Director of the Cluster Munition Coalition. It is important to note that not all financial links with cluster munitions producers are listed in the Hall of Shame. Reporting challenges include limited availability of public information about the production of cluster munitions and investments in cluster bomb producers. 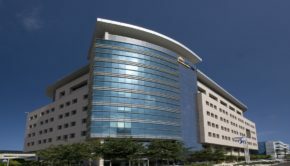 In addition, for practicality purposes this report only includes significant investments over a threshold of 0.1% for share and bond holdings. A listing of all financial links reviewed is available online here. In addition to the decrease of investments in cluster munitions producers, the report also shows a marked increase in the number of financial institutions explicitly excluding cluster munitions producers from investment. In the 2018 report a total of 110 financial institutions were identified as explicitly excluding investments in cluster munitions, up from 84 in the 2017 report. The report notes a growing trend among investors to put in place clear divestment policies and highlights some 48 standouts in this regard in the Hall of Fame including Dutch pension fund ABP, among the 5 largest funds in the world, Norwegian bank DNB and Canadian asset manager Aviso Wealth. Under the Convention on Cluster Munitions, assisting in the production of cluster munitions is banned. 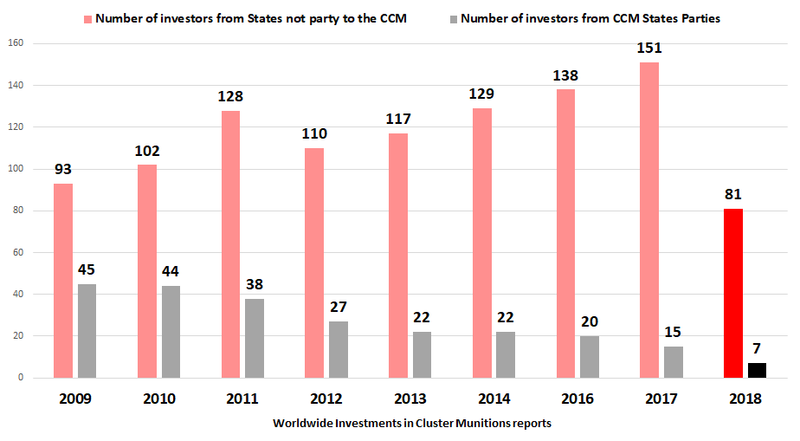 According to the report, a growing number of states – 46 states up from 38 in the previous report – have articulated the view that investing in cluster munitions production is therefore clearly prohibited by the Convention – a full listing of states can be seen here. “States are increasingly seeing financing of cluster munitions as paramount to support for use of these horrible weapons. At a time when cluster munitions use has reappeared in the conflicts in Syria and Yemen among others, it is more critical than ever to end = investments in these internationally banned weapons,” said Michel Uiterwaal, project lead on cluster munitions at PAX and co-author of the report. 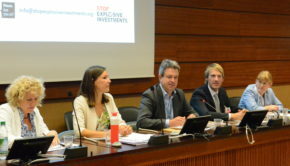 “Civil society activism and clear guidelines set by governments have played a key role in global disinvestment from cluster munitions producers,” Uiterwaal added. Cluster munitions are indiscriminate weapons that pose a serious threat to civilian populations during and long after an attack. Because of their inherently indiscriminate nature, cluster munitions are prohibited under the 2008 Convention on Cluster Munitions. December 3, 2018 marks the tenth anniversary of the Convention on Cluster Munition signing in Oslo, Norway. To date, a total of 120 States have joined the Convention. PAX, a member organization of the Cluster Munition Coalition, works towards a world free of cluster munitions. Under PAX leadership, the Stop Explosive Investments campaign calls on all financial institutions and states to end all investments in companies continuing to invest in cluster munitions production. Without funding, these bombs cannot be produced, and each weapon that is not produced cannot cause harm to civilians. 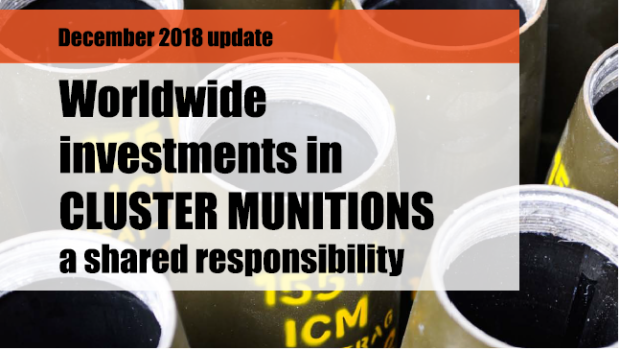 The 2018 update of the report “Worldwide Investments in Cluster Munitions; a shared responsibility” was written and edited by PAX (the Netherlands); research company Profundo and Omega Research Foundation provided input and data for the report.